Sumerian (speaker of the Sumerian language) from Sumer, located in Southern Mesopotamia, is one of the earliest known civilizations in the world. It lasted from the first settlement of Eridu in the Ubaid period (late 6th millennium BC) through the Uruk period (4th millennium BC and Dynastic periods (3rd millennium BC) until the rise of Babylon in the early 2nd millennium BC. The cities of Sumer were the first to practice intensive, year-round agriculture (from ca. 5300 BC). The surplus of storable food created by this economy allowed the population to settle in one place instead of migrating after crops and herds. It also allowed for a much greater population density, and in turn required an extensive labor force and division of labor. This organization led to the necessity of record keeping and the development of writing (ca. 3500 BC). Most authorities credit the Sumerians with the invention of the wheel, initially in the form of the potter's wheel. The new concept quickly led to wheeled vehicles and mill wheels. The Sumerians' cuneiform writing system is the oldest for which there is evidence (excluding proto-writing such as the Vin_a signs and the even older Jiahu signs). The Sumerians were among the first astronomers, mapping the stars into sets of constellations, many of which survived in the zodiac and were also recognized by the ancient Greeks. The five planets that are visible to the naked eye have Sumerian names. They invented and developed arithmetic using several different number systems including a mixed radix system with an alternating base 10 and base 6. This sexagesimal system became the standard number system in Sumer and Babylonia. They may have invented military formations and introduced the basic divisions between infantry, cavalry and archers. They developed the first known codified legal and administrative systems, complete with courts, jails, and government records. The first true city states arose in Sumer, roughly contemporaneously with similar entities in what is now Syria and Israel. Several centuries after the invention of cuneiform, the use of writing expanded beyond debt/payment certificates and inventory lists to be applied for the first time, about 2600 BC, to messages and mail delivery, history, legend, mathematics, astronomical records and other pursuits. Conjointly with the spread of writing, the first formal schools were established, usually under the auspices of a city-state's primary temple. Finally, the Sumerians ushered in the age of intensive agriculture and irrigation. Emmer wheat, barley, sheep (starting as moufflon) and cattle (starting as aurochs) were foremost among the species cultivated and raised for the first time on a grand scale. The Sumerians were a non-Semitic people and were at one time believed to have been invaders, as a number of linguists believed they could detect a substrate language beneath Sumerian. However, the archaeological record shows clear uninterrupted cultural continuity from the time of the Early Ubaid period (5300 – 4700 BC C-14) settlements in southern Mesopotamia. The Sumerian people who settled here farmed the lands in this region that were made fertile by silt deposited by the Tigris and the Euphrates rivers. Despite the lack of corroborating written records, it is generally agreed that Sumerian speakers were farmers who moved down from the north, after perfecting irrigation agriculture there. The Ubaid pottery of southern Mesopotamia has been connected via Choga Mami Transitional ware to the pottery of the Samarra period culture (c. 5700 – 4900 BC C-14) in the north, who were the first to practice a primitive form of irrigation agriculture along the middle Tigris River and its tributaries. The connection is most clearly seen at Tell Awayli (Oueilli, Oueili) near Larsa, excavated by the French in the 1980s, where 8 levels yielded pre-Ubaid pottery resembling Samarran ware. Farming peoples spread down into southern Mesopotamia because they had developed a temple-centered social organization for mobilizing labor and technology for water control, enabling them to survive and prosper in a difficult environment. Alternatively, the Sumerians may have been an indigenous culture of hunter-fishers who lived in the reedy marshlands at the mouth of the Tigris and Euphrates Rivers, as the Marsh Arabs do today. This culture contributed to a cultural fusion with northern agriculturists, creating Sumerian language and civilization. Like other cities of Asia Minor and the Mediterranean, Sumer was a polytheistic, or henotheistic, society. Their lives were spent serving the gods in the form of man-made statues. There was no organized set of gods; each city-state had its own patrons, temples, and priest-kings. The Sumerians were probably the first to write down their beliefs, which were the inspiration for much of later Mesopotamian mythology, religion, and astrology. 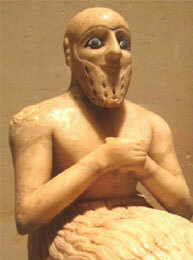 The Sumerians worshipped An as the full time god, equivalent to "heaven"—indeed, the word "an" in Sumerian means "sky." His consort Ki, means "Earth". Collectively the gods were known as Anunna ((d)an-unna = "offspring of the lord"). An's closest cohorts were Enki in the south at the E'abzu temple in Eridu, Enlil in the north at the E'kur temple of Nippur, and Inanna, the deification of Venus, the morning (eastern) and evening (western) star, at the E'anna temple (shared with An) at Uruk. The sun-god Utu was worshipped at Sippar, the moon god Nanna, was worshipped at Ur. These deities were probably the original matrix; there were hundreds of minor deities. The Sumerian gods (Sumerian dingir, plural dingir-dingir or dingir-re-ne) thus had associations with different cities, and their religious importance often waxed and waned with those cities' political power. The gods were said to have created human beings from clay for the purpose of serving them. If the temples/gods ruled each city it was for their mutual survival and benefit—the temples organized the mass labor projects needed for irrigation agriculture. Citizens had a labor duty to the temple which they were allowed to avoid by a payment of silver only towards the end of the third millennium. The temple-centered farming communities of Sumer had a social stability that enabled them to survive for four millennia. Sumerians believed that the universe consisted of a flat disk enclosed by a tin dome. The Sumerian afterlife involved a descent into a gloomy netherworld to spend eternity in a wretched existence as a Gidim (ghost). Ziggurats (Sumerian temples) consisted of a forecourt, with a central pond for purification. The temple itself had a central nave with aisles along either side. Flanking the aisles would be rooms for the priests. At one end would stand the podium and a mudbrick table for animal and vegetable sacrifices. Granaries and storehouses were usually located near the temples. After a time the Sumerians began to place the temples on top of multi-layered square constructions built as a series of rising terraces, giving rise to the later Ziggurat style. The Sumerians developed a complex system of metrology c 4000 BCE. This metrology advanced resulting in the creation of arithmatic, geometry, and algebra. From 2600 BCE onwards, the Sumerians wrote multiplication tables on clay tablets and dealt with geometrical exercises and division problems. The earliest traces of the Babylonian numerals also date back to this period. The period 2700–2300 BCE saw the first appearance of the abacus, and a table of successive columns which delimited the successive orders of magnitude of their sexagesimal number system. The Sumerians were the first to use a place value numeral system. There is also anecdotal evidence the Sumerians may have used a type of slide rule in astronomical calculations. The almost constant wars among the Sumerian city-states for 2000 years helped to develop the military technology and techniques of Sumer to a high level. The first war recorded was between Lagash and Umma in ca. 2525 BC on a stele called the Stele of Vultures. It shows the king of Lagash leading a Sumerian army consisting mostly of infantry. The infantrymen carried spears, wore copper helmets and carried leather or wicker shields. The spearmen are shown arranged in what resembles the phalanx formation, which requires training and discipline; this implies that the Sumerians may have made use of professional soldiers. The Sumerian military used carts harnessed to onagers. These early chariots functioned less effectively in combat than did later designs, and some have suggested that these chariots served primarily as transports, though the crew carried battle-axes and lances. The Sumerian chariot comprised a four or two-wheeled device manned by a crew of two and harnessed to four onagers. The cart was composed of a woven basket and the wheels had a solid three-piece design. 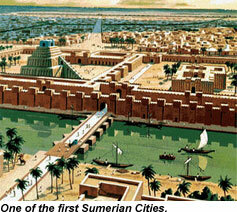 Sumerian cities were surrounded by defensive walls. The Sumerians engaged in siege warfare between their cities, but the mudbrick walls failed to deter some foes. Examples of Sumerian technology include: the wheel, cuneiform, arithmetic and geometry, irrigation systems, Sumerian boats, lunisolar calendar, bronze, leather, saws, chisels, hammers, braces, bits, nails, pins, rings, hoes, axes, knives, lancepoints, arrowheads, swords, glue, daggers, waterskins, bags, harnesses, armor, quivers, war chariots, scabbards, boots, sandals and harpoons.